Congratulations to Sprint Waste Services Safety Manager Robert Blanco, the 2018 recipient of the Joe M. Atkinson Distinguished Safety Award, presented by the Houston Council of Safety Professionals (HCSP). 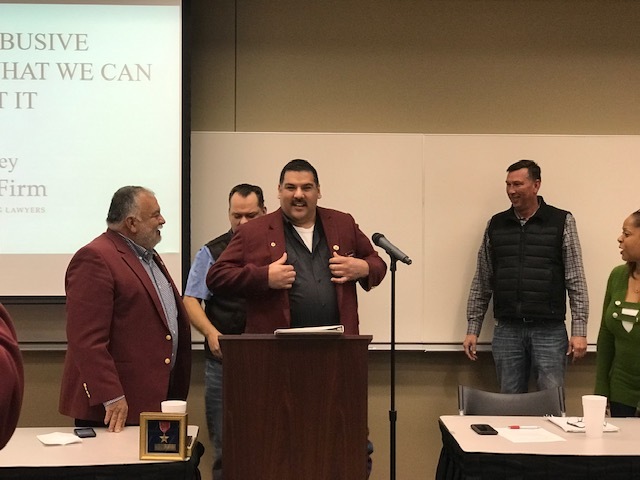 Blanco was announced as the winner Friday in a special ceremony at the group’s monthly meeting. The prestigious award was established in honor of the late Joe M. Atkinson, a charter and founding member of the Houston Council of Safety Professionals (formerly the Gulf Coast Safety Council) who was known for his high safety and ethical standards—and a former employee of the Sprint Companies. Each year the Joe Atkinson award honors a member whose unselfish devotion to the principals of the HCSP distinguishes himself or herself and preserves the high moral and safety standards embodied by Atkinson. Nominees must have "moral standards above reproach with an attitude toward the preservation and improvement of life through positive safety attitudes and principles," according to the organization. Blanco served as 2018 chairman of the HCSP, capping years of involvement and leadership in the organization. The HCSP promotes safety within the Houston-area transportation community, with a mission to increase safe practices, efficiency and economy in all phases of commercial vehicle transportation. The council’s estimated 200 members include transportation safety professionals, law enforcement agencies and safety product professionals. Among the organization’s activities are annual truck driving competitions for professional drivers, golf tournaments that provide scholarships for children of HCSP members, and numerous safety seminars throughout each year. The group meets on the second Friday of the month at Houston Community College. For more information, click here or call 713.946.4000, ext. 244.